Houston Police Chief Charles A. McClelland Jr., Harris Country District Attorney Devon Anderson and City Attorney Donna Edmundson participated in a panel discussion and answered questions from the public on the new Texas Open Carry legislation, which will allow a license holder to “open carry” a handgun in a holster starting January 1, 2016. This informational meeting addressed state law and municipal authority over the regulation of firearms in Texas. Houston Police Chief Charles A. McClelland Jr., Harris Country District Attorney Devon Anderson and Senior Assistant City Attorney Tracy Calabrese participated in a panel discussion and answered questions from the public on the new Texas Open Carry legislation, which will allow a license holder to “open carry” a handgun in a holster starting January 1, 2016. This informational meeting addressed state law and municipal authority over the regulation of firearms in Texas. What are the differences between a firearm, hand gun, and a long arm? A firearm means any device designed, made, or adapted to expel a projectile through a barrel by using the energy generated by an explosion or burning substance or any device readily convertible to that use. A long gun or long arm is a firearm designed to be fired with both hands, such as a rifle or shotgun. A handgun is a firearm designed to be fired with one hand, such as a revolver or pistol. What are “premises” for the purpose of Texas gun laws excluding firearms? Under Section 46.03 and 46.035 of the Penal Code, “premises” means a building or a portion of a building. The term does not include any public or private driveway, street, sidewalk or walkway, parking lot, parking garage, or other parking area. If I see a person openly carrying a handgun, should I call the police? You can call the police, but before you call, observe how the person is acting. If they are acting suspicious, or entering a building where weapons are prohibited such as a school, call the police. Examples of when to call law enforcement include: 1) Gun is removed from a secured holster; 2) Gun holder seems intoxicated; 3) Gun holder appears very agitated or is causing a disturbance; or 4) Gun holder is obviously committing a crime or acting in a reckless or suspicious manner. For emergency/life threatening calls, dial 911. For non-emergency calls, contact 713-884-3131. What type of class or training is required to obtain a Texas License to Carry a Handgun? May a citizen ask a license holder for proof of licensing? A citizen may ask a license holder for proof that he or she is legally carrying a weapon, but the license holder does not have to respond. However, in the instance of a request by a property owner, a refusal to respond by the license holder may result in the license holder being denied permission to enter or remain on the property. Under state law, where am I allowed to carry a firearm? • Long Guns or Long Arms: Because state law governs firearms, and because it does not prohibit the carrying of a rifle or shotgun in a public place, a person is generally allowed to carry those weapons in public in Texas. However, property owners, including governmental entities, may exercise their rights under the general trespass statute (Penal Code Section 30.05) to exclude individuals from carrying long guns on their property. Failure to leave the property when requested to do so could result in you being charged with criminal trespass. • Handguns without a license to carry: The open carry of handguns in public is prohibited in Texas, unless the person holds a license to carry a handgun. An unlicensed person may carry a handgun on his or her private property or in a car or boat. A handgun carried in a car or boat by an unlicensed person must be hidden from plain view. • Handguns with a license to carry: A license holder may generally carry a handgun in a concealed manner or openly carry it in a belt or shoulder holster beginning January 1, 2016. However, see the answers to the questions below for numerous limits on that authority. Can I openly carry or concealed carry on private property? Yes, provided that the property does not display the signs described in Section 30.06 and Section 30.07 of the Texas Penal Code at each of its entrances. Regardless of whether any signage is present, however, if the owner or manager asks you to remove the weapon or leave the property, you must comply. Failure to leave the property when requested to do so could result in you being charged with criminal trespass. If I am asked to leave a store for openly carrying a weapon, can I cover up the gun and go back in the store if I have a license to carry a handgun? Yes, if the store does not also prohibit concealed carry, unless the store owner or manager asked you not to return, in which case returning would constitute a criminal trespass. If I want to prohibit both concealed carry and open carry in my private business, what signs do I need to have displayed? You must have the sign described in Penal Code Section 30.06 to prohibit concealed carry, and the sign described in Penal Code Section 30.07 to prohibit open carry. If I am a private business owner but I do not have the proper 30.06 and 30.07 signs posted and I ask someone who is carrying a weapon to leave my property, are they legally required to leave even though I don’t have the proper signs? Yes. As a private business owner you can tell someone to leave if they are carrying a weapon whether or not you have the proper signs posted. Can I open carry in a vehicle? Yes, as long as the handgun is in a shoulder or belt holster and you have a license to carry a handgun. If you do not have a license to carry a handgun, you must keep your handgun hidden from plain view. Can I store a firearm in my vehicle at work? You should check with your employer. Generally, if you hold a license to carry a handgun or otherwise legally possess a firearm, a private or public employer cannot prohibit you from storing your firearm or ammunition in a locked, privately-owned motor vehicle in a parking lot, parking garage, or other parking area the employer provides for employees, except as allowed under Labor Code Sec. 52.062. This limitation on employers does not apply to situations covered by Labor Code Sec. 52.062 which include 1) any property where possession of a firearm or ammunition is forbidden by state or federal law; 2) a vehicle owned or leased by your employer; 3) a school district; or 4) an open-enrollment charter school or private school. Can my employer prohibit me from carrying a firearm at work? Yes. A public or private employer may prohibit employees from possessing any firearms on the premises of the employer’s business, even if the employee is licensed to carry a handgun. 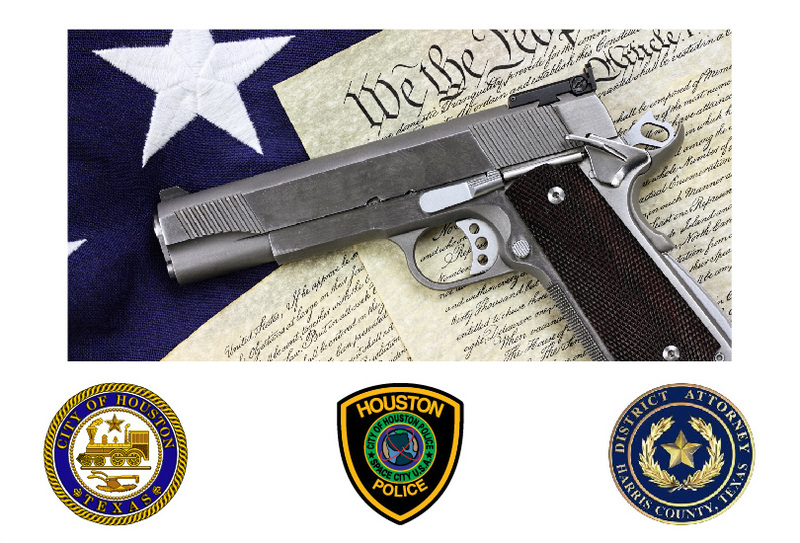 All City of Houston employees, except those who are required to do so in the performance of their official duties, are prohibited from possessing weapons while on duty, in a city vehicle, or while on city property. The prohibition does not extend to off-duty possession by a handgun license holder in a public area as authorized by state law. City employees are not prohibited from transporting or storing a firearm or ammunition in a locked, privately owned motor vehicle in accordance with state law. See Sec. 14-184 of the City Code of Ordinances and the Mayor’s Executive Order 1-37. What places are firearms (including handguns) forbidden by law? If I have a license to carry a handgun, are there any other places state law forbids me from carrying my handgun openly or concealed? Can I carry at my university or college? Not yet. Starting August 1, 2016, concealed carry on college campuses and other institutions of higher education (except for junior colleges) is legal if you have a license to carry a handgun. Open carry is still prohibited. Starting August 1, 2017, concealed carry at a public junior college is legal if you have a license to carry a handgun. Private or independent institutions of higher education can establish rules or regulations prohibiting handguns on their campus. Public institutions of higher education may also establish rules and regulations regarding the carrying of concealed handguns by license holders on campus, but they may not establish provisions that generally prohibit or have the effect of generally prohibiting license holders from carrying concealed handguns on the campus of the public institution. Can I carry at a governmental institution if I have a handgun license? Yes, you may generally carry in state and local governmental institutions but see Questions 13, 14, and 15 for exceptions. Also, a peace officer may temporarily disarm a license holder when he or she enters a nonpublic, secure portion of a law enforcement facility. A license to carry a handgun gives no special right of access to parts of governmental buildings and facilities that are not open to the general public. You may not carry on federal properties in most circumstances. You may not knowingly possess or cause to be present a firearm in federal facilities operated by federal agencies, such as the IRS, SSA, USDA, and federal courts, unless you are a federal or state law enforcement officer or a member of the armed forces authorized by federal law to carry at that location or are hunting on federal property in accordance with federal law. See 18 U.S.C. § 930. Some organizations that are in opposition to open carry have said that if they see someone openly carrying a handgun, they will call 911 and say that person is being aggressive and threatening people with the weapon. How will the police handle situations like this? The police will act with caution when approaching the person. They will collect the facts, and if it is found that this person was doing nothing wrong, the investigation will be turned towards the person who made the false 911 call. Will the presence of an openly carried handgun during a verbal altercation between two people elevate this altercation to an aggravated assault because a handgun has been “exhibited”? No, in most instances it will not be considered aggravated assault as long as the person carrying the weapon was not threatening to use it. However the District Attorney will make the final determination as to proper charges based on the specific circumstances of the situation. If an officer sees me openly carrying a handgun in a shoulder or belt holster, is that officer legally able to ask me for proof that I have a handgun license? If I am carrying a handgun, and I am approached by a police officer, what steps should I take to ensure that the police officer and I feel safe during this interaction? Do as the officer asks. Tell the officer you are carrying a weapon and have a license to do so. Do not reach for the weapon. Let the officer tell you what to do with the weapon. On houstonpolice.org, there are videos that illustrate what you should do when you are in contact with a police officer. Would the mere carrying of an open handgun qualify as a display of a firearm in a manner calculated to alarm in violation of Section 42.01(a)(8) of the Texas Penal Code if another person says he is alarmed or afraid? No, as long as the handgun is in the holster as required by law. How will the Deaf be kept safe when they are approached by a police officer and there is difficulty telling the officer that they are reaching for their license rather than their gun? Police officers and cadets are instructed in proper ways to communicate with and seek translation services involving the Deaf during police interactions regardless of the nature of the interaction. During any interaction with an officer, all persons should follow the instructions of the officer. No, a person convicted of certain crimes cannot carry a firearm. Generally, if you can lawfully possess a firearm, you can open carry with a handgun license. You must be 21 years old to obtain a license to carry, unless you are in the military, a veteran, or honorably discharged, in which case you can get a license if you are at least 18. I already have a Concealed Handgun License (CHL). Will I need to get another license for open carry? No. Your CHL will qualify you to openly carry a handgun is a shoulder or belt holster. The CHL will later be changed to a License to Carry (LTC). What is a “belt holster” and what kind of holster would be a violation? The law does not define a “belt holster”; the law just states you must carry your handgun in a “shoulder or belt holster.” A “drop down” holster attached to your belt is considered to be a belt holster. Am I required to use a retention holster? The only requirement is that it be a belt or shoulder holster. The Houston Police Department recommends a retention holster to better ensure that your firearm remains secure while carried openly or concealed.